Krakatau volcano (Krakatoa) lies in Sunda Strait between Sumatra and Java Islands. It belongs to Lampung Province. 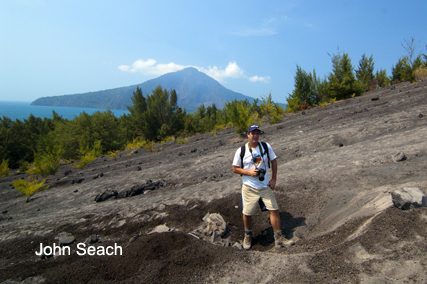 Krakatau Volcanic Complex consists of Rakata, Sertung, Panjang and Anak Krakatau Islands. Anak Krakatau is the currently active centre at the volcano and emerged from the sea in 1930. Krakatau volcano photos by John Seach. The photos on this page are before the December 2018 paroxysm. The island has dramatically changed and is now sterile of plant and animal life. 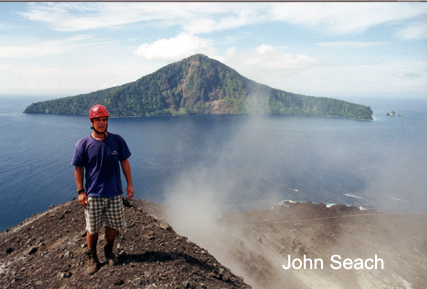 Warning: climbing Anak Krakatau is currently very dangerous and should not be attempted. 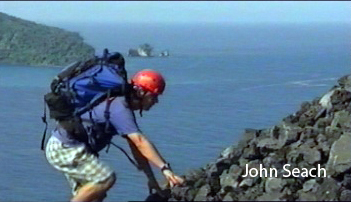 John Seach climbing Krakatau volcano. 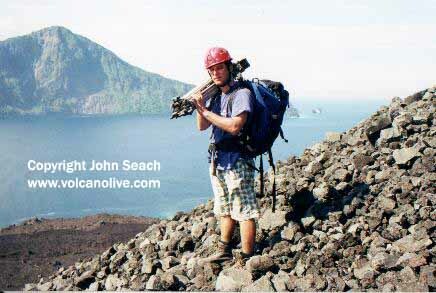 John Seach at summit of Krakatau volcano, Indonesia. Krakatau became famous after the paroxysmal eruption on August 27, 1883. The volcano erupted more than 18 cubic km of ash to a height of 80 km, and produced a tsunami as high as 30 m along the west coast of Banten and south coast of Lampung. The tsunami hit 295 villages and killed over 36,000 people. A paroxysmal eruption at Krakatau volcano occurred on 22 December 2018 . Ash emissions reached 60,000 ft altitude. The eruptions caused a tsunami which hit Tanjung Lesung Beach, Sumur Beach, Teluk Lada Beach, Panimbang Beach, and Carita Beach. The eruption had a volcanic explosivity index (VEI) of 4. Height of the volcano has decreased from 338 m to 110 m. The volume lost from the 22 December 2018 eruption is estimated at 150-180 million cubic meters. Effects of the 22 December 2018 tsunami from eruption of Krakatau volcano, Indonesia; 431 people killed, 7200 injured, 46,646 displaced, 1,527 heavily damaged houses, 434 damaged boats and ships. On average only one eruption per year worldwide has this magnitude. Hotspots were visible on satellite images of Krakatau volcano on 17-18 February 2017. Renewed eruptions possible. On 2nd September 2012 constant tremor was recorded at the volcano, accompanied by Strombolian eruptions to a height of 300 m above the crater. The explosions rattled windows on the west coast of Java, 50 km away. The alert status at Krakatau was raised to level 3 (out of a maximum 4). A 1 km exclusion zone was placed around the crater. 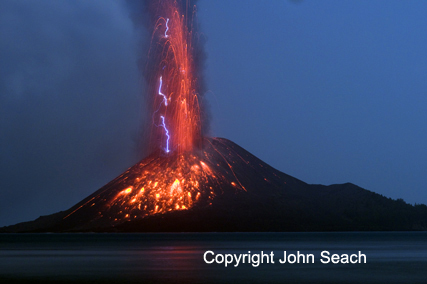 Eruptions from Krakatau volcano, Indonesia forced the evacuation of tens of thousands residents on 11th January 2011. Seven districts affected were Kalianda, Rajabasa, Katibung, Sidomulyo, Ketapang, Sragi and Palas. On Monday ash from Anak Krakatau continued to cover residential areas in parts of Banten province and South Lampung. Visual observations showed ash emissions reaching a height of 600 m and drifting east. Ashfall affected the operation of seismometers on the volcano. Fisherman and tourists were advised to stay at least 2 km from the volcano. On 29th October 2010 there were 136 eruptions at the volcano, compared to a recent average of 10 per day. Krakatau volcano was raised to level 2 alert. Alert level at Krakatau volcano in Indonesia has been lowered from Siaga (Level III) to Waspada (Level II). Explosion earthquakes measured over the past few months were August 4311, September 541, and October 34. There has been a significant decline in eruptive activity at the volcano since August 2009. 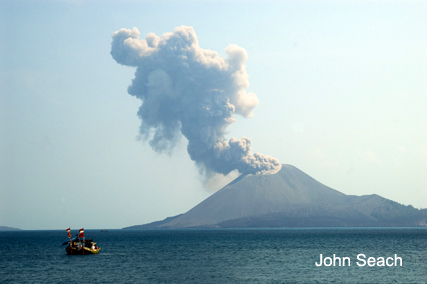 People are still advised to avoid landing on Anak Krakatau. Communities in the coastal areas of Banten and Lampung have been warned not to believe runours that the eruption Anak Krakatau will cause a tsunami. Fishing boats are permitted around Anak Krakatau. 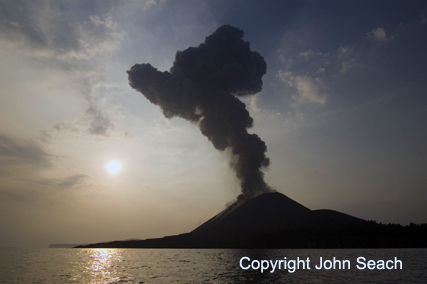 Eruptions are continuing at Krakatau volcano in Indonesia from a crater on the SW side of the cone in May 2009. A volcanic ash advisory from Darwin VAAC reported ash to 10,000 drifting NW of the volcano. On 6th May 2009 the level of alert at Krakatau was raised from Waspada (Level 2) to Siaga (Level 3), out of a maximum level 4. 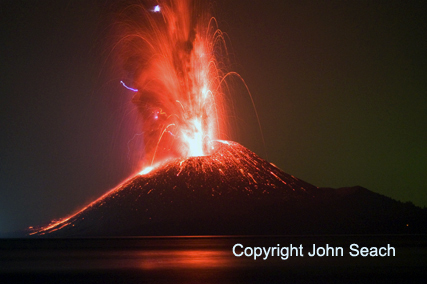 A renewed period of eruptions began at Krakatau on 19th March 2009, when 19 explosions were recorded. Between 1-25 April 2009 there have been 4060 explosions. Number of explosion earthquakes measured are 30 April 229, 1 May 324, 2 May 318, 3 May 250, 4 May 403, 5 May 371, and 6 May 132 (until midday). Shallow volcanic earthquakes, and tremor have been recorded. Visual observations from Rajabasa District in Sumatra in April reported ash emissions from 50-1000 m above the summit. From 1-24 April booming noises were heard from Sumatra 174 times, 83 times from 25-29 April. 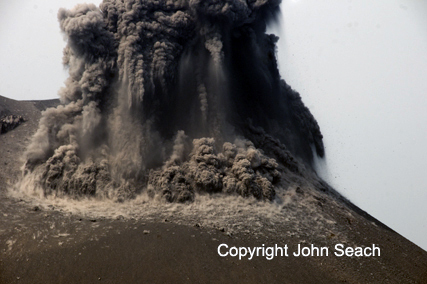 No sounds were heard from Krakatau between 30th April and 6th May. 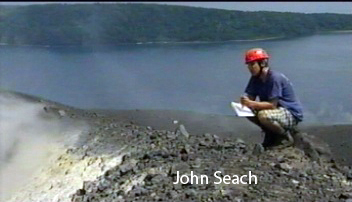 Incandescent material and ash are being emitted to a radius of 500 m from the crater. Pyroclastic flows may reach a distance of 700 m from the crater. Ash is falling 5 km from the volcano. Requests from the Indonesian Directorate of Volcanology and Geological Hazard Mitigation request people stay at least 2 km from the volcano. Local communities are still allowed to fish outside the 2 km danger zone radius. Communities in the coastal province of Banten and Lampung are requested to remain calm and not fear a tsunami. The first recorded observations of Krakatau eruptions were made by Johan Wilhelm Vogel (1704, 1716), an employee at the gold mine Salida on Sumatra. 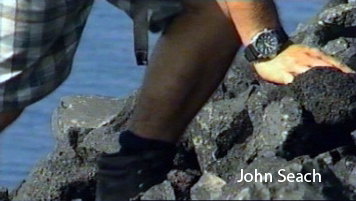 He sailed past the volcano in 1680-81. On 1st February 1681 he was saw the island completely barren and burnt, where previously it was overgrown with trees.